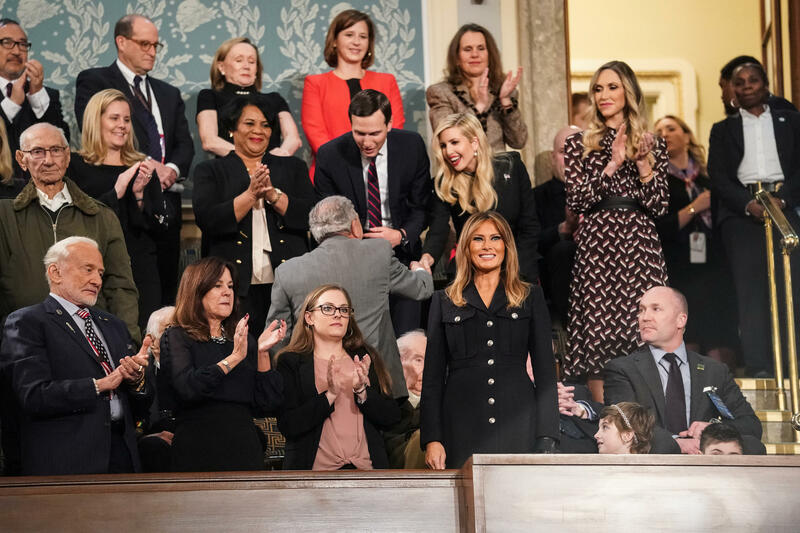 First lady Melania Trump stands with her guests ahead of Tuesday's State of the Union address. Lawmakers, along with the president and first lady, pick guests every year to highlight or protest the policies of an administration. Headlining the president's guest list is Matthew Charles. In 2016, after serving 21 years in prison, Charles won early release. He got a job and started volunteering, but less than two years later he was sent back to prison after an appeals court found there had been a mistake with his release. He was released from prison again earlier this year, just weeks after Trump signed the First Step Act into law. The criminal justice law, which reduced sentences for certain federal drug crimes, among other provisions, may be Trump's crowning bipartisan achievement from his first two years in office. 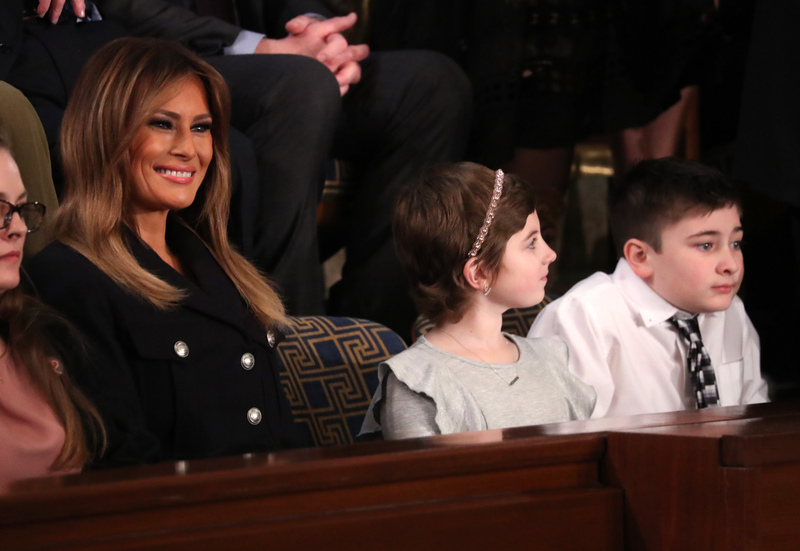 The frst lady sits with guests Grace Eline (center), a cancer survivor, and Joshua Trump (right), a Delaware student who has been bullied because of his last name, during Tuesday's State of the Union address. In a nod to Melania Trump's "Be Best" initiative, she will also host a sixth-grader named Joshua Trump who "has been bullied in school due to his last name." The first lady's guests also include a young cancer survivor, a lumber plant manager who benefited from the new tax law and a survivor of the attack on the Tree of Life synagogue in Pittsburgh. Sen. Jeff Merkley, D-Ore., said he will "highlight the human suffering" caused by the president's immigration policy by bringing Albertina Contreras Teletor and Yakelin Garcia Contreras, a mother and daughter who were separated at the Southern border last year. Yakelin, who turns 12 on Tuesday, was separated from her mother for nearly two months before they were reunited. "This child separation policy came from a dark and evil place within the heart of this administration," Merkley said in a statement. Rep. Jimmy Gomez, D-Calif., will bring Sandra Diaz, a former undocumented immigrant who worked at the Trump National Golf Club in Bedminster, N.J., for a number of years. But Trump will have his share of supporters for his hard-line approach to immigration as well. Representative Chip Roy, R-Texas, is inviting Brandon Judd, the president of the National Border Patrol Council. Trump thanked Judd on Twitter in January for speaking in support of building a wall along the Southern border. Another Texan, Republican Sen. John Cornyn, is inviting Manny Padilla, the Border Patrol's Rio Grande Valley sector chief, an aide in Cornyn's office confirmed to NPR. Tennessee Republican Sen. Marsha Blackburn and Rep. Tim Burchett are bringing Knoxville Fire Department Capt. D.J. Corcoran and Wendy Corcoran. They are the parents of Pierce Corcoran, 22, who died in a car accident in December 2018. Corcoran was in a car crash with a driver who is an undocumented immigrant and who has been charged with negligent homicide and driving without a license or insurance. The accident has fueled the ongoing national debate over illegal immigration. "The tragedy the Corcoran family has endured is one no family should ever have to experience," Blackburn said. "The attendance of Pierce's parents at the State of the Union serves as a reminder that we, as a Congress, have a duty to keep the American people safe." The recent partial government shutdown — the longest in U.S. history — has prompted Democrats including Sen. Chris Van Hollen of Maryland and Sen. Elizabeth Warren of Massachusetts to bring federal workers affected by the shutdown. Van Hollen is working on legislation to give federal contractors back pay. Sen. Kamala Harris, D-Calif., will bring Trisha Pesiri-Dybvik, an air traffic control specialist who lost her home in a 2017 wildfire and who was also furloughed. Freshman rising star Rep. Alexandria Ocasio-Cortez, D-N.Y., is bringing Ana Maria Archila, a community activist and sexual assault survivor who confronted then-Sen. Jeff Flake, R-Ariz., in an elevator over his support for then-Supreme Court justice nominee Brett Kavanaugh. The emotional moment was caught by TV cameras and quickly went viral, although it did not ultimately affect Kavanaugh's confirmation or Flake's support for it. Sen. Kirsten Gillibrand, D-N.Y., and Rep. Chris Pappas, D-N.H., are both bringing guests to protest the Trump administration's ban on transgender people serving in the military. Gillibrand is bringing Lt. Cmdr. Blake Dremann, the first openly transgender service member to be promoted, and Pappas is bringing Tavion Dignard, a transgender man and retired Navy veteran. "Denying transgender Americans their right to serve this country is a disgrace," Pappas said. "They deserve equal treatment by their government and the law." A handful of House Democrats, including Georgia Rep. John Lewis, plan to skip the speech entirely, according to The Hill.